A convertible version of the high-powered BMW M4 goes on sale this summer. Revealed at April's New York International Auto Show, the 2015 BMW M4 Convertible joins BMW's expanding lineup that now includes the two-door M4 coupe and four-door M3 sedan. Like the newest generation of M4 and M3 fixed-roof cars, the 2015 BMW M4 Convertible uses a turbocharged 3.0-liter inline-6 good for 425 horsepower and 406 pound-feet of torque, paired with a 7-speed dual-clutch automated gearbox or a 6-speed manual. The high-revving engine is lighter and more powerful than the V8 used on the last-generation M3, redlining at 7300 rpm. Peak torque is available from just 1800 rpm to 5500 rpm. BMW estimates the M4 Convertible can race from 0-60 mph in just 4.2 seconds with the dual-clutch and 4.4 seconds with the automatic. The 2015 BMW M4 convertible shares the same architecture and body with the 4 Series convertible, with a three-piece retractable hardtop and a noise-absorbing headliner, which BMW says is quieter than the previous-generation 3 Series convertible and provides added insulation. According to BMW, the power-folding top can completely fold up or down in 20 seconds and be operated at speeds of up to 11 miles per hour. Weighing about 90 pounds less than the outgoing M3 convertible, the M4 convertible uses more lightweight materials in place of heavier steel; the front fenders and hood are aluminum, and the drive shaft of the M4 is made from carbon-fiber-reinforced plastic (CFRP). Performance features are the same found on the M4 coupe and M3 sedan, including a standard Active M differential and a more aggressively tuned electromechanical steering setup with three driving modes. Adaptable suspension is optional, and lets drivers choose between Comfort, Sport and Sport Plus modes. Carbon ceramic brakes are also optional. In the cabin, new front bucket sport seats use a single-piece back panel, which BMW says was inspired by racecars. Signature contrast stitching, as well as the M logo, can be found throughout the interior. And just to make sure nobody forgets they're driving an M car, the M logo on the seat backrests in the M4 convertible are illuminated. Like other BMWs, the 2015 BMW M4 Convertible can be equipped with a bevvy of infotainment and electronic options, including navigation, a head-up display, and the Active Driving Assistant, a collision mitigation and pedestrian warning system. 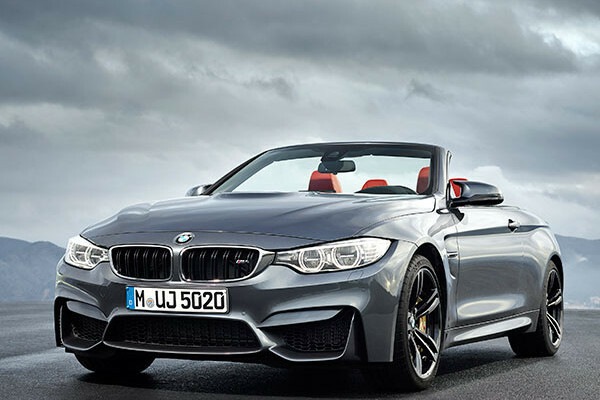 The 2015 M4 Convertible goes on sale in Summer 2014 with a starting price of $73,425 including destination and handling.